Melt 3 tablespoons butter in a 9- or 10-inch oven safe skillet. Add brown sugar, cinnamon, and the sliced apples. Sauté until apples are soft.Turn off the heat and let the apples and the glaze cool and stick to the bottom when the batter is poured on top. Beat eggs with an electric mixer. Add milk, cream, sugar, salt, and vanilla. Mix until sugar is dissolved. Sift in flour and mix until smooth. Let the batter rest for about 10 minutes. After the apples have cooled pour batter over the apples and place into the oven for 16 to 18 minutes or until the top begins to brown. Remove it from the oven; cool for one minute. Loosen pancake from pan by running spatula around the edges of the pan. 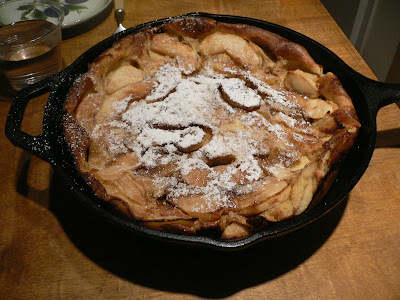 Put a plate on top of pan and invert the pan and plate together so that the pancake comes out upside down on the plate. Serve with a dusting of powdered sugar if desired.